I am usually checking how fast our sites are loading anytime we make major changes to the sites. 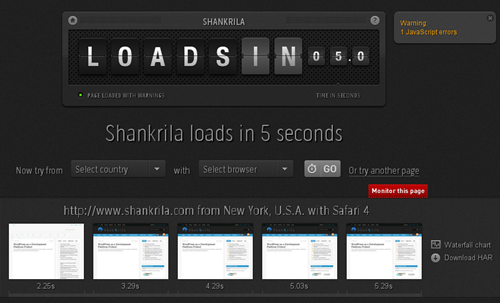 I just came across a cool website that can show how fast a webpage loads from 50 different locations. 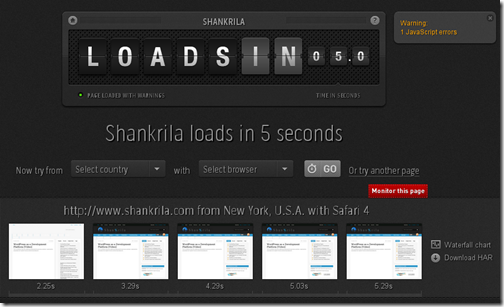 Loads.in is a very nice looking website that shows hos fast a website loads. It runs through different locations and shows you the times on various browsers. You can also select different countries and different browsers and check your website loading time. A very useful tool for those with websites or even if you just wanted to see the effects of CDN (Content Delivery Network) for popular websites. I never knew that such tool existed. This would come in handy especially whenever i design websites. Thank you for sharing.